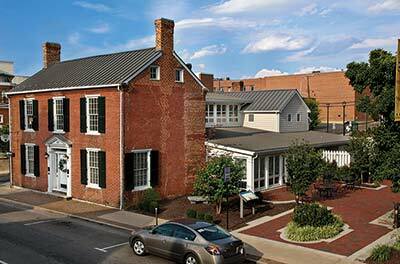 The Wilderness Road passed through what became the center of Harrisonburg— Court Square. Those who traveled the path—Iroquois to Cherokee, German to Scots-Irish—fell in love with Harrisonburg’s scenic beauty and wealth of natural springs. Much like the people who inhabit the land today, these settlers loved their land, their family, and their God. Daniel Harrison (1701–1770) moved from Delaware to Rocking­ham County about 1738. Daniel Harrison is thought to have built the house in 1749 and operated a grist mill, distillery, and general store at the site. The house was expanded and the windows enlarged before the Civil War. 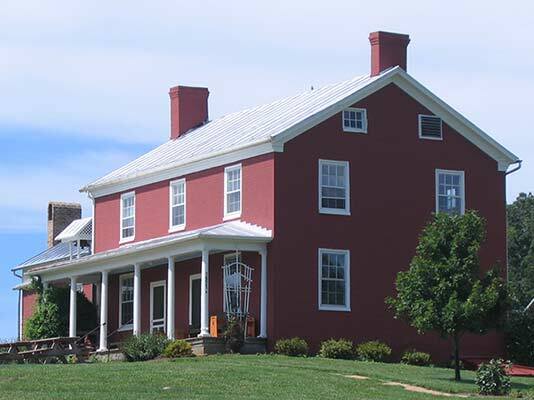 The restored house is open to the public on weekends during the warm months. 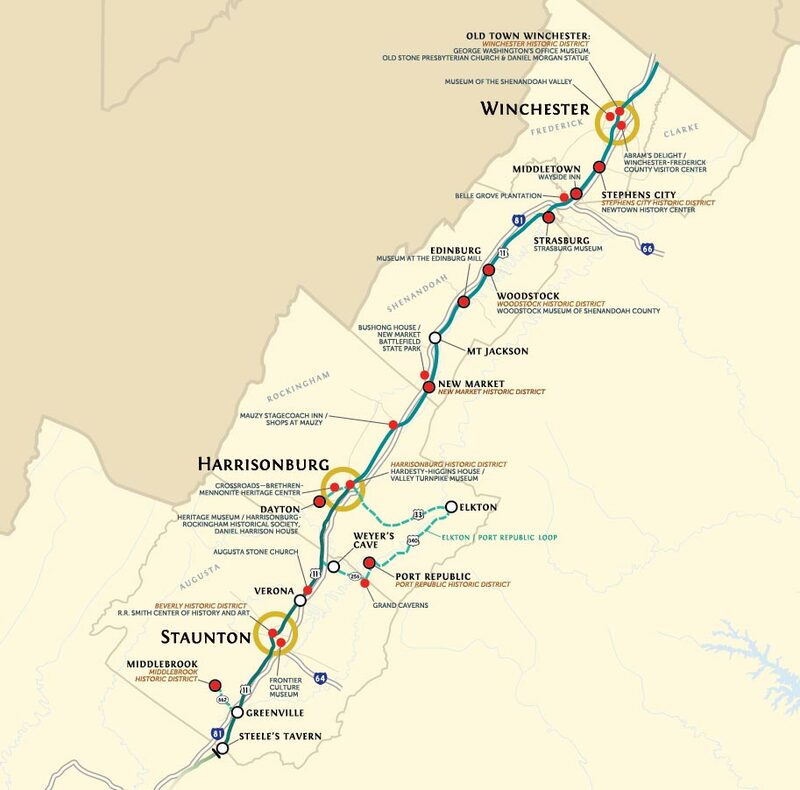 The town of Dayton grew up after 1828 along the Harrisonburg-Warm Springs Turnpike southwest of Harrisonburg. The main exhibit at the extensive Heritage Museum recounts Rockingham County’s history from the Native American period to the present. Exhibits include prehistoric artifacts, folk art, the local effects of national wars, and local economic and industrial history. The society also provides an extensive research library and a wide variety of local genealogical books for sale in the gift shop. 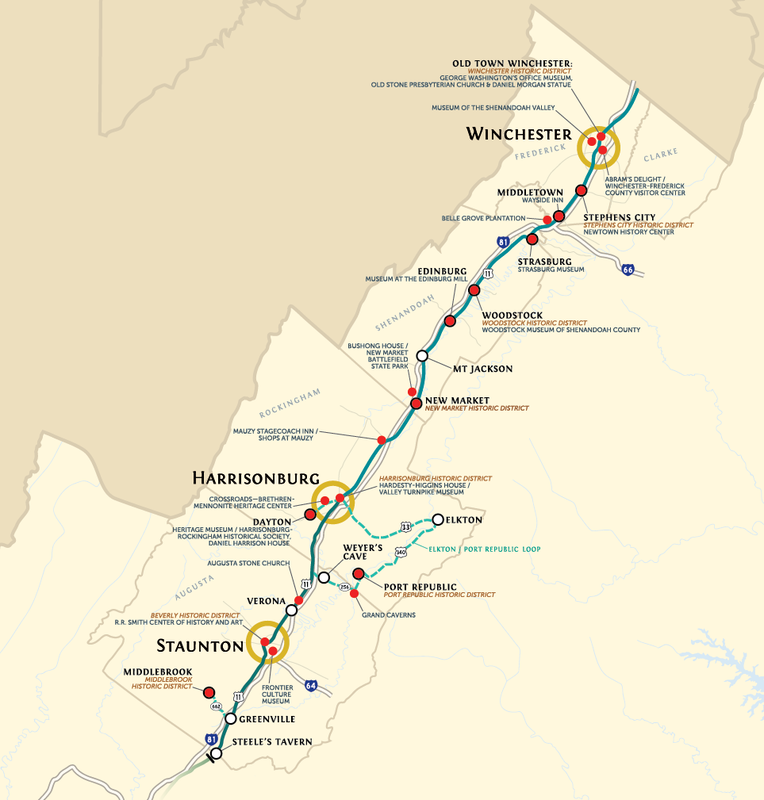 Mennonites and Brethren have lived quietly in the Valley of Virginia for over two centuries. The Cross­­roads Heritage Center interprets their long history of faith, their unique farming traditions, their pacifism, and their legacy of crafts­manship to tourists and members of the Brethren and Mennonite communities. It incorporates an outdoor museum, including the relocated 1854 Burkholder-Myers House, home of an important Mennonite bishop, and the Whitmer School/Cove Mennonite Church, a one-room school house/meetinghouse. The land of Thomas and Sarah Harrison was selected in 1779 as the site for the seat of the new county of Rockingham. The town was provided with a central courthouse square, used as a model for towns across the nineteenth-century Midwest. 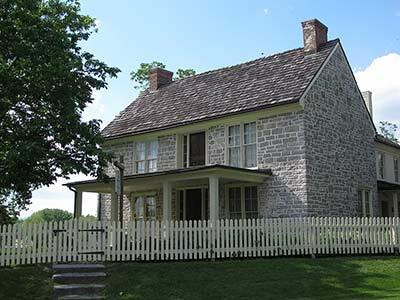 The Hardesty-Higgins House, located directly on the route of the Great Wagon Road/Valley Turnpike, was begun by physician Henry Higgins in 1848. In addition to the Valley Turnpike Museum, which chronicles transportation through the Valley, it contains a visitor center, gift shop, and cafe. 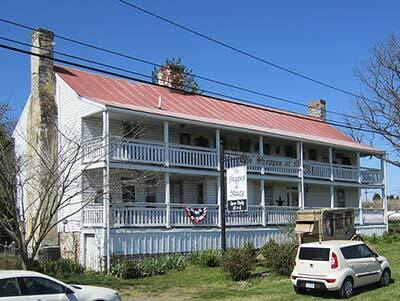 This antebellum stagecoach inn was built to serve travelers on the Valley Pike, 10 miles north of Harrisonburg. The long frame building is fronted by a two-story porch and includes a number of original outbuildings. Today it is open to the public as a collection of shops, selling gifts, decorative items and antiques.